The Town of Chios, which is called "Chora" by the locals, was built in the central east part of the island like all the adjoining in Asia Minor islands. Chios is situated opposite to the peninsula of Erythraia from which is separated with a narrow straight (channel), a position that proves the close connection between Chios and Ionia. Chora is built almost in the center of the east coast and is the most significant harbor in the island. According to archeological finds the island has been inhabited since 6000B.C. 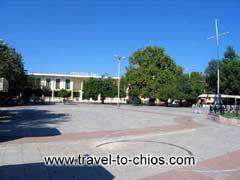 Chios town was built by Ions little before 1000 B.C. So, Chora has a history of more than 3000 years time. During this period Chios enjoyed great prosperity but also a decline.